Manuscript H consists of three pocket notebooks bound together. In them, Leonardo begins to study Euclidian geometry, an understanding of which was a prerequisite for drawing the geometrical forms of polyhedrons for Luca Pacioli’s De Divina Proportione, which Pacioli subsequently commissioned from Leonardo. 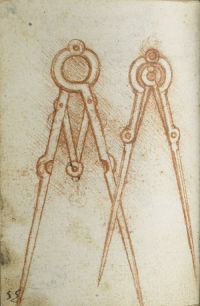 He also considers the design of drawing instruments, such as compasses. The annotations on Euclid contained in these notebooks sometimes consist solely of drawings or diagrams. The three notebooks belong to the same period and form a manuscript of 142 folios.